This Sunday’s lectionary Gospel text is an odd one. Go read Mark 6:14-29 for yourself and let me know if you think so too. Okay, you’re back. Why is it an odd text? Here’s why I think it’s odd: Jesus doesn’t show up. It is a long excursus about Herod and his troubles with John the Baptist. Herod Antipas is plagued with well-earned guilt for murdering John to please his wife and daughter. Though I doubt the daughter was entirely pleased in the end. Imagine the soldier coming to her door. Special Delivery: One severed human head . On a platter. No surprise she quickly passed it on to her mom. Uh mom … I think you wanted this? I count it as one of the grossest moments in Holy Scripture. There are all kinds of illustrative moments in the story, maybe even morals. 1. Herod has sinned, but doesn’t know how to deal with it — and that totally messes with his mind. Moral of the story: When you sin big, make your confession and find forgiveness. The cover up will just lead you to say and do further crazy things. 2. Herod is prone to making rash promises — and that is not a good character trait. His daughter dances at his birthday party and he rushes out and offers her any wish she might think of. She is welcome to ask for anything up to a full half of his realm. That’s bad parenting. Just sayin’. Do you want broccoli or a salad, your choice. You read the story. The offer didn’t end well. 3. Herod is too committed to pleasing those around him. Having your mind set on being kind to those around you is an excellent thing. Wanting to show love to people is great, whether they are your family, your courtiers if you have some, or the guests at your birthday party. “Love your neighbor” is always a worthy guide. But you miss the mark if you think you have to make these people happy. If you think you are obliged to please all these people, you are going to end up in a world of hurt. You might know, for instance, that a certain prophet of God whom you have in your dungeon should be kept alive. But if you want to please your daughter and your wife, you might end up committing murder — at least if you are Herod Antipas. And if you made a rash promise in front of your courtiers and other minions and guests at your birthday party (see #2 above) you might feel you need to follow through in order to please them too, or to not be ashamed in front of them. Moral of the story: Set out to love God and your neighbor, but don’t think that you can please all, or most, or really any of the people all the time. What I find interesting about this story, though, is the way it played out in the later history of the church. John was a major player in the story of Jesus, and Christians have traditionally made a very big deal about him. He is not just the cousin who baptized Jesus. John is “the forerunner,” the last of the Old Testament prophets, a hinge figure in salvation history. You find him in the commemorations of the Church year East and West, and in Christian art. 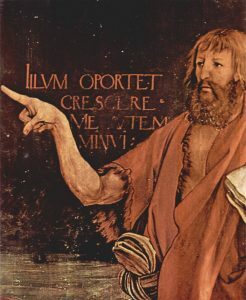 Karl Barth particularly liked John in the Grünewald alter piece, with his long and bony finger pointing to Christ on the cross. He wasn’t there, of course. Grunewald brought him back from the grave and reattached his head for the picture. What I personally enjoy, though, are some of the Orthodox icons of John the Baptist. Often he’s pictured, not only with the wings of an angelic messenger, but with two heads. One sits on his shoulders, where you expect it. A second lies on a platter, as delivered to Herod’s daughter. Sometimes the head on the platter is at his feet. Sometimes he holds it in his own arms. I always expect him to look down at his head in surprise, but he steadfastly faces forward. Actually sometimes he sort of seems to roll his eyes at the situation. But the early Christians were very keen on holy relics (as Catholic and Orthodox Christians are still). Relic ar body parts of saints and martyrs. Like, say, their heads. Mark tells us John’s body was buried — but where was his head? Well, this holy relic was lost for a very long time, buried on Herod’s property by the pious wife of his steward. The discovery of the head of John the Baptist was a notable day, and is celebrated still every year. But then the head got lost again (Oops.) So the Orthodox calendar also includes a celebration of the second finding of the head of John the Baptist. And if losing it once were not enough, eventually circumstances required the Church also celebrate the third finding of the head of John the Baptist. I suppose since the saint had a hard time keeping a firm grip on his own head we shouldn’t be surprise that the Church has done no better. My Monday Meditations, even when they go up on Tuesday, are my own personal exploration of the Gospel text assigned by the Revised Common Lectionary for the coming Sunday. I’d love to send every one of these, along with my other new articles and announcements, straight to your inbox. Scroll down to the black box with the orange button to subscribe to my weekly(ish) newsletter, and all this will be yours.